The Terrier Hockey Fan Blog: One departs, one staying? 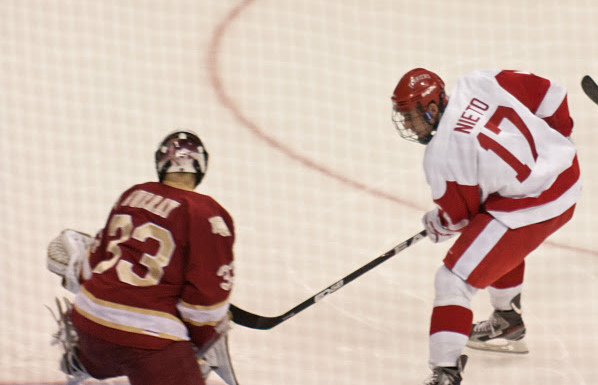 Junior wing Matt Nieto will give up his final year of eligibility to sign with the San Jose Sharks. The Long Beach, California, native who scored 102 points (44g, 58a) in three varsity seasons, signed a three-year, entry-level contract worth a reported $833,000 a year, and will join the Sharks’ AHL team in Worcester. He’ll find a familiar face there in former BU co-captain John McCarthy, now in his fourth professional season and captain of the Worcester Sharks. Nieto talked about his new challenge and his decision process with The Boston Hockey Blog’s Annie Maroon. Nieto, who was a Sharks second round draft choice (#47 overall) in the 2011 entry draft, could find himself facing a former teammate tomorrow night when Worcester hosts Bridgeport, where Ben Rosen is skating under an amateur tryout contract. BU’s other junior who might be considered a “flight risk,” blueliner Garret Noonan, has told WTBU Sports Radio that he will return for his senior season and why. An assistant captain this past season, the defenseman, drafted by Nashville in the 4th round of the 2011 draft, has a 26-35-61 line in three varsity seasons.